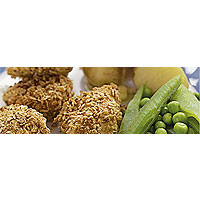 Children will love helping to make these easy chicken nuggets, which are delicious dunked in a sour cream and chive dip. Preheat the oven to 200C, gas mark 6. Put the multigrain flakes in a plastic bag and tie the top. Use a rolling pin to crush the flakes into small crumbs. Tip the flour, beaten egg and crushed flakes into three separate shallow bowls. Dip each chicken chunk in the flour to coat lightly, then dip in the egg and finally the crushed flakes. Place the coated chicken on a baking tray lined with baking parchment and cook for 20-25 minutes, turning once, until the coating is lightly golden all over and the chicken thoroughly cooked. Meanwhile, cook the potatoes in boiling water for 15 minutes or until tender, adding the peas and beans for the last 2-3 minutes. Serve the chicken nuggets with the dip, the peas and beans, and the Jersey Royals, topped with a knob of butter. Use standard cornflakes to coat the chicken, if you prefer. For a different flavour and texture, try adding a handful of sesame seeds or a little grated cheese, such as Cheddar or Parmigiano Reggiano, to the crumb mix. Serve with a pomegranate juice drink.